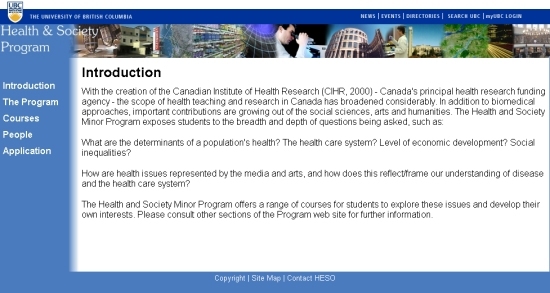 The Health and Society Program was a new academic program created in 2004 and launched for the 2005-2006 academic year. Being a new program, there was no existing web site or other presence, and the site would be a new creation with concepts and themes from semi-related and unrelated sources. The committee wished for a site with a visual style that was clean and simple while conveying a theme of health. The program is humanities based, thus it should be created without a strong scientific presence. The courses link dynamically integrated course information from the HESO program and the University's centralized course databases. This provided prospective students current course information without having to look up information on the university student homepage. The site did not last long as the university was developing a global web presence, and this site was one of the first to adopt the new style (the new top bar was incorporated, and a few months later the site itself).